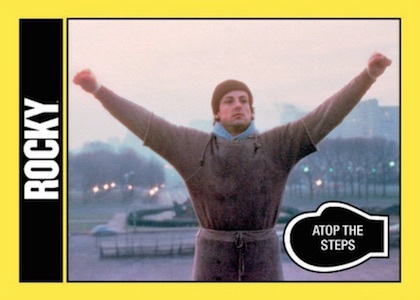 Paying tribute to the legend of Rocky across multiple films, 2016 Topps Rocky 40th Anniversary looks back to the various movies that center on the iconic boxer with a factory set. Adding an appealing chase, there are limited on-card autographs for Sylvester Stallone to be found in the online-exclusive release. 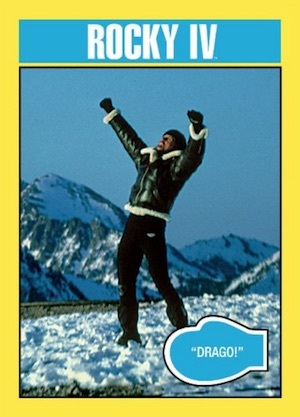 Highlighting various moments in Rocky history, base cards mimic the design of 1979 Topps Rocky II with a yellow frame border and filled glove image in the corner. The specific film is also noted along with a basic caption. The full list of movies in the set lineup include Rocky (1976), Rocky II (1979), Rocky III (1982), Rocky IV (1985), Rocky V (1990), and Rocky Balboa (2006). As the complete set features 330 cards, each film receives strong coverage. Randomly inserted Autographs (1:125 boxes) portray a much more basic look with hard-signed signatures. Sylvester Stallone (as Rocky Balboa) is the only signer but there are four different image versions available. These cards are very rare as each edition only has ten copies. 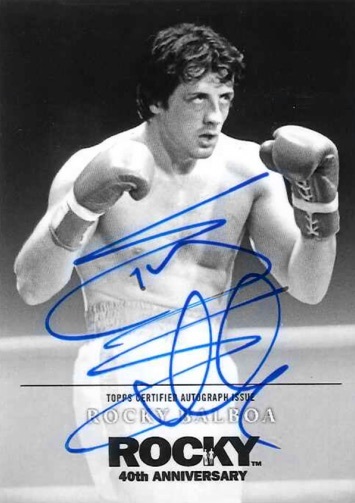 The 2016 Topps Rocky 40th Anniversary Complete Set is found through Topps.com for $59.99. 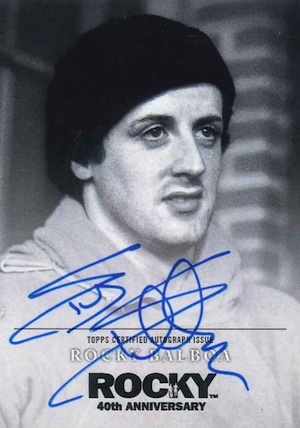 Collectors may remember Stallone has previously signed for Topps in 2015 Allen & Ginter and 2016 The Mint as Rocky Balboa. This is also not the only release to honor the 40th anniversary of the first Rocky film. Topps produced a special ten-card Rocky 40th Anniversary set that was originally found at the 2016 National before being made available online. 330 cards. Specific film coverage is noted below. 130 "What are you afraid of?" 167 "Another right, another right!..." 168 "Somebody Get a Doctor!" 183 "I must break you"
211 A win for the U.S.
259 You Talkin to Me? 272 Advice from Rocky Jr.
329 Paulie and Rocky Jr.
330 Rocky and Rocky Jr.
4 different cards. Serial numbered #/10. 1:125 boxes. What stores will I be able to find the packs in? Each edition only has ten copies. HUH? How many did he sign total? How many of these boxes are there?